More than 50 million people in the United States suffer from pain in the absence of injury. This includes patients with migraines, fibromyalgia, irritable bowel syndrome and many other disorders. "These people have no injuries, or reasons to experience pain," says Frank Porreca, PhD, a pharmacologist and neuroscientist at the University of Arizona College of Medicine – Tucson. "But for some reason, they are hurting." For these uninjured patients, research has shown that stress is the most common trigger of their pain. 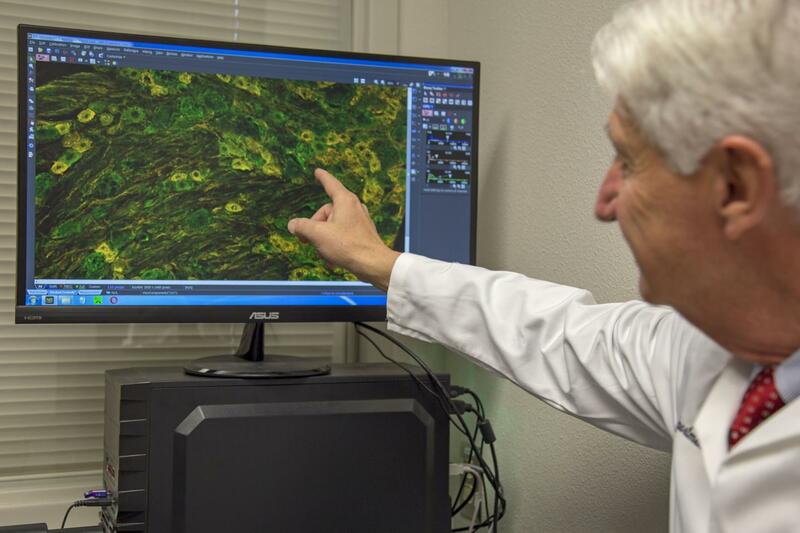 Now, a five-year, $2.7 million grant from the National Institute of Neurological Disorders and Stroke will allow Dr. Porreca and his research team to study exactly how stress produces pain – and how to stop it from occurring. "Everyone suffers from stress. But in most cases, stress doesn't produce pain," explains Dr. Porreca. "Nevertheless, some people suffer from chronic pain without any injuries. It's as if they are hypersensitive, or vulnerable, to stress; their stress somehow results in pain." Other members of the team include Edita Navratilova, PhD, a research assistant professor in the Department of Pharmacology, and co-principal investigator Volker Neugebauer, MD, PhD, a colleague at Texas Tech University Health Sciences Center. The team will study the amygdala, a portion of the brain responsible for the emotional experience of pain. Specifically, its members will analyze neurons in the amygdala that respond to stress through signaling at the kappa opioid receptor. They believe this process is a key culprit behind pain produced from stress. Using genetically engineered mice and novel genetic tools, the researchers will turn these neurons on and off and observe if this reduces pain experienced as a result of stress. If successful, the findings could help identify a class of drugs for the treatment of humans suffering from stress-related chronic pain conditions. "If we identify a drug that can block kappa opioid signaling in humans, it may be possible to 'turn off' or reduce the pain caused by stress in these vulnerable people," Dr. Porreca says. No effective treatments for pain in the absence of injury currently exist, Dr. Porreca says. Medications like opioids and steroids don't work for everyone and they also cause undesired side effects, including potential dependence and addiction, and may even be fatal if taken incorrectly. "Chronic pain can be debilitating, and the dependence on opioids often leads to consequences that may be far worse than the original complaint," said UA President Robert C. Robbins, MD. "Both opioid addiction and stress-related pain are important issues in Arizona and across the nation. I am very glad that Dr. Porreca and his team are advancing this area of pain management research, which could potentially help many people live healthier, more active, and fulfilling lives." The research project is funded through the NINDS under award No. R01NS106902. The University of Arizona College of Medicine – Tucson is shaping the future of medicine through state-of-the-art medical education programs, groundbreaking research and advancements in patient care in Arizona and beyond. Founded in 1967, the college boasts more than 50 years of innovation, ranking among the top medical schools in the nation for research and primary care. Through the university's partnership with Banner Health, one of the largest nonprofit health care systems in the country, the college is leading the way in academic medicine. For more information, visit medicine.arizona.edu.